In the science literature ,, and ordinary life noise means any undesirable, unwished sounds. From this point of view, influence of noise on auditory analyzer and whole organism described well enough. In later works of these and other authors,,, noise influence on organism, depending on duration of work and noise spectral characteristics were specified and studied in details. Forced, “passive” listening of the noise, which contains characteristics of equipment work. It happens when data display is deficient or data display information is inadequate according to the situation (e.g., car drivers or sea craft captains, coal miners etc.). Noise property analysis according to its physical characteristics and its signal, biological significance is related with function of brain structures. Such information comes to cortical centers in different ways. The organization of central mechanisms of stimulus evaluation has evolution significance. On the first steps of evolution the nervous system reacts on those stimuli, which are determinate inborn structure of neurons connections (unconditioned reflex reactions). On the later evolution steps ability of reception of signals becomes possible. These signals were analyzed according to physical parameters, not a biological significance. Such reaction wasn't inborn, but developed constantly during a life on the temporary coincidence of these signals with certain, biological substantial organism's activity, that is according to conditioned reflex. It is logical to suppose difference between biological effects of “neutral” and significant noise. Peculiarities of hearing impairment among two groups of operators in relation with features of acoustic stimuli and informative significance of the noise. A sound meter Ш-003-M2 No 3949 (Russia) was used for estimation of equivalent noise level. Audiometer MA-31 was used for assessment of permanent hearing threshold levels at common accepted audiometric frequencies. Determination of occupational noise and estimation of noise-induced hearing impairment was done according to ISO 1999: 1990. According to the recommendations of the International Electro technical Commission (IEC) and the ISO Technical Committee TC 29 for measurements of noise load on telephone operators with telephone headsets was used “artificial” ear type 4152 (of “Bruhl and Kъer” (Denmark), which conforming to IEC 126 and ANSI Z.24.9-1949. Subjective assessment of informational significance of the noise was determinate according authors' questionnaire. Based on the features of interaction with acoustic stimulus, the authors divided the examinee into four groups which are shown at [Table 1]. The procedures followed were in accordance with the ethical standards of a responsible committee on human institutional experimentation and with the Helsinki Declaration of 1975, as revised in 1983. Examinees' names, initials, or hospital numbers were not used. Common statistical methods were used in research. Mean quantity and mean absolute errors were calculated. Statistical significance between operators' groups was calculated with 0.05 confidential intervals. For assessment of functional state of the auditory analyzer among several operator groups, method of determination of permanent shifts of sensitivity threshold was used. In our opinion, findings allow to make two obvious conclusions about characteristics of noise sensibility in relation with special relationships of operators with acoustic stimuli. A comparison of noise-induced permanent threshold shifts of operators differentiating acoustic signals is illustrated in [Figure 1]. Noise-induced permanent threshold shifts of operators forced to work in noise background are illustrated in [Figure 2]. Comparison of these pictures shows that features of changes of permanent shifts of sensitivity thresholds depending on frequency are different in case of differentiation of acoustic signals and “passive” listening of the noise. Thus, at the [Figure 2] audiograms have classical curve with peak in 4000 Hz, while at the [Figure 1] maximum is in the field of language frequencies. 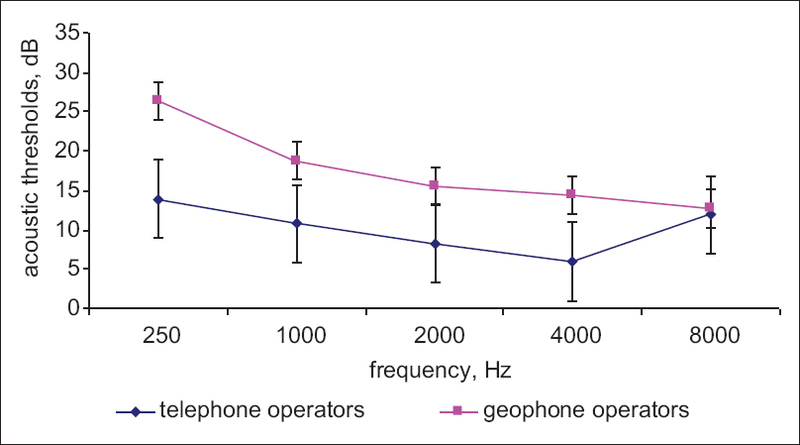 The second conclusion is based on the comparison of acoustic thresholds and spectrum of active noise: The correlation between them for operators differentiated signals is higher. Naturally, there is a question about the reasons of such differences. It is possible to suggest, that features of noise spectrum characteristics, in conditions of low energy of active noise have more significance in its biological activity than the doze. This assumption casts doubt on the energy concept, because even data at [Figure 1] show that in group of telephone operators level of the noise is higher than 80 dBA which is distinctive for many branches of industry. Second suggestion is related with a necessity to differentiate the acoustic signals identifying them in noise. However it is impossible to suggest that noise at the workplaces of coal miners and rolling mill operators is absolutely neutral in biological sense. This is evidenced by data of the survey which are shown in [Figure 3]. 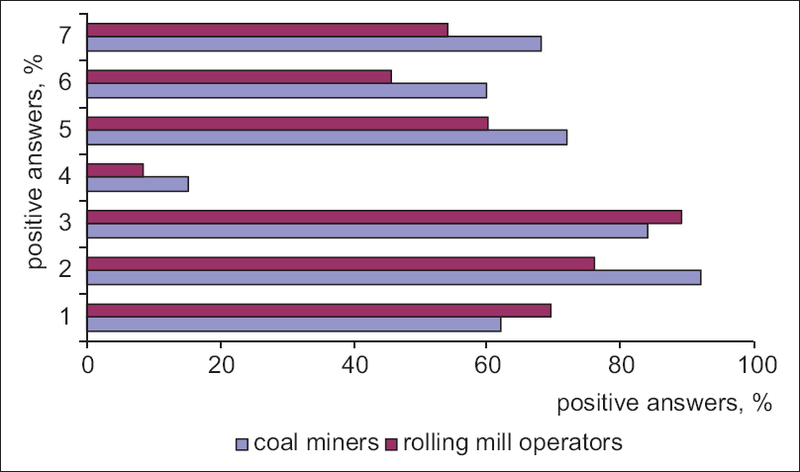 [Figure 3] shows that subjective significance of noise, as the source of information is very important both for coal and steel industries. That may be partly due to the insufficient number of display facilities or their low user characteristics. Indirectly this fact is approved by data of questionnaire: 10.0% of coal miners and 6.5% of rolling mills operators believe that implantation of additional devices will improve the situation. 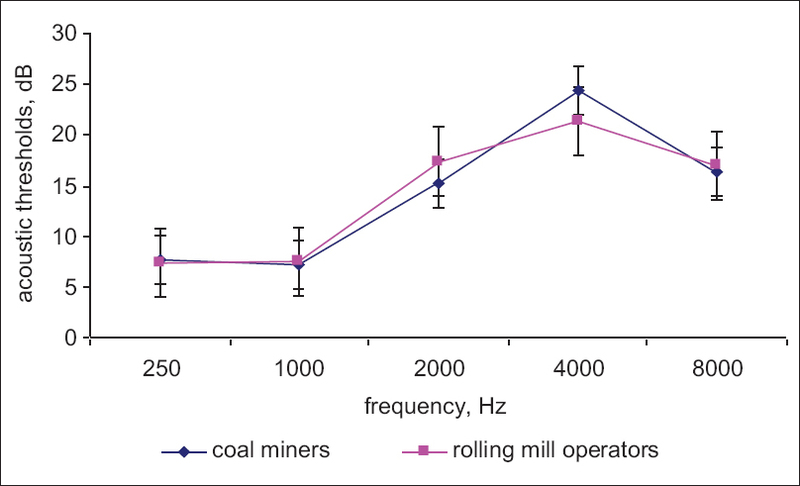 In current conditions [Figure 3], 62.0% of coal miners and 69.6% of rolling mills operators can determine a normal functioning of equipment only by noise; 92.0% and 76.1% accordingly can determine equipment failure. Majority of examinee (84.0% of coal miners and 89.1% of rolling mills operators) use this information during the work process. Steel workers do it more frequently (54.3% - “always” and 19.6% - “often”), while positive answers on these questions got 38.0% and 18.0% accordingly. Analogously noise is estimated as a source of information when own or colleague's safety is in danger [Figure 3]. 72.0% of coal miners and 60.1% of rolling mill operators suggest that they can identify situation of own safety threat; 60.0% and 45.6% of workers accordingly can identify situation of colleague's safety threat. This information is used by 68.0% of coal miners and 54.2% of rolling mill operators. Usefulness of information contained in physical characteristics of noise is estimated by workers differently. 16.0% of coal miners consider that noise is very important in routinely work as a source of information. Only 2.2% of rolling mill operators answer positively this question. Authentically more of coal miners (38.0% and 10.8% accordingly) consider that information of workplace acoustic field helps to provide safety. Without reference to occupation more than one third of examinee (34.0% and 34.7%) accenting positive role of the noise, as information source suppose that it is necessary to decrease its level. In conditions of action of the same noise according to temporary and spectrum characteristics but different equivalent level some small changes from canal connection is occur. These distinctions may be related with necessity to recognize acoustic signals and theirs frequent characteristics. 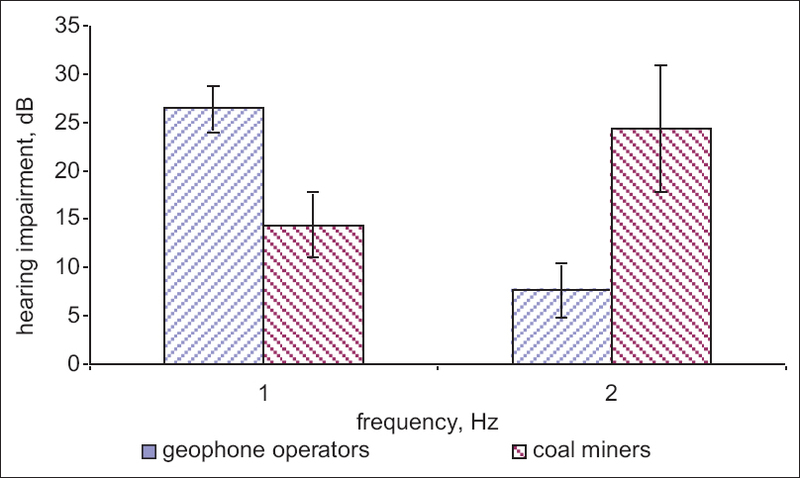 Comparison of acoustic thresholds of geophone operators and coal miners' is illustrated in [Figure 4]. Therefore, on the base of coal miners and rolling mill operators' questionnaire, noise is used as additional source of information. Apparently acoustic field characteristics change faster than data display, provided in technological process. These changes allow workers to puzzle out in current situation. There are main reasons of noise listening: Some of them need to get “technological” information (whether the equipment works properly or not and the course of technological process), others, on the base of noise characteristics, make conclusion about their and/or colleagues' safety. Human ability to hand signal significance to nonspecific environmental parameters is used in practice in several industry branches. Cain W.S. considered that it was possible to warn about danger of gas ejection by adding odorants. They were established that average person can feel smell before gases ejection is 1/5 spontaneous combustion level. Occupational noise for workers with certain duration of work isn't neutral; it has both irrigative, negative action and plays a role of a source of important information. Those elements of distinction of information take part in “passive” listening. In psychophysiological literature such mechanisms are described: Repeated signal creates its own track (or model) in CNS. Comparison between model and active signal is occurring constantly without consciousness. If difference between them occurs, consciousness involves in analysis (“alarm situation?”, “equipment failure?”, “danger?” etc). In case of non-language signals distinction, consciousness is working constantly. Frequent characteristics of signals play main role in non-language signals distinction (“s” and “k” sounds, for example have different frequency; the situation is the same for non-language signals). Therefore signal spectrum is more important than its energy. As a result we have two different types of audiograms [Figure 1] and [Figure 2] with opposite values of hearing loss in the field of language frequencies and on the 4000 Hz. Hearing impairment and risk of hearing handicap depends on both noise energy and human interaction with acoustic irritant. In conditions of differentiation of acoustic signals the hearing impairment may be more significant (especially in language frequencies) than in conditions of “passive” listening of the noise. Peak in 4000 Hz specific for occupational noise is absent. These particular qualities may be related with necessity of deliberate analysis of acoustic signals in one case and sneaking analysis in another one, but mechanism of such difference needs further investigations. Indexes of hygienic assessment of occupational noise are required. The authors would like to thank the companies Zasyadko coal mine and Ukrtelecom JSC for their assistance with the collecting of data research. We wish to thanks the leadership of SI “Institute for Occupational Health of the National Academy of Medical Sciences of Ukraine” (Kyiv) and the leadership of the State enterprise Research Institute for medical and ecological problems of Donbas and coal mining industry (Donetsk) for their technical support of this project. Rosenhall U, Pedersen K, Svanborg A. Presbycusis and noise-induced hearing loss. Ear Hear 1990;11:257-63. Seidman MD, Standring RT. Noise and quality of life. Int J Environ Res Public Health 2010;7:3730-8. Henry BA, Turner CW, Behrens A. Spectral peak resolution and speech recognition in quiet: Normal hearing, hearing impaired, and cochlear implant listeners. J Acoust Soc Am 2005;118:1111-21. Moore B. An Introduction to the Physiology of Hearing. 5th ed. San Diego: CA: Academic Press; 2003. Turner CW, Chi SL, Flock S. Limiting spectral resolution in speech for listeners with sensorineural hearing loss. J Speech Lang Hear Res 1999;42:773-84. Ivanitskiy AM, Strelets VB, Korsakov IA. Informational Processes of the Brain and Mental Activity. Moscow: Nauka; 1984. p. 200. Handbook for Acoustic Ecology, B Truax-Editor, 2nd Edition, 1999. Published by Cambridge Street Publishing. Available from: http://www.sfu.ca/sonic-studio/handbook/Sound_Propagation.html. [Last accessed on 2014 Jan 13]. Mc Cinnes E. Emotionality and perceptual defense. Physiological review 1949;56:244-65. Phares EJ. Perceptual threshold decrements as a function of skill and chance expectancies. J Psychol 1962;53:399-407. Cain WS. Smell of danger: An analysis of LP-gas odorization. Am Ind Hyg Assoc J 1985;46:115-26. Sokolov V. Neuronal Mechanisms of Memory and Education. Moskow: Nauka; 1981. p. 140.